Making your own home cured back bacon is much easier than you probably think. And it's so much better than the junk you get from supermarkets, believe me. First of all, you'll need some curing salts - you can buy this online. And then you'll need some pork loin. You may be able to buy this without bones, or more likely it will come with ribs attached. You need to trim the meat from the bones. If there is any skin or rind on the meat, that will have to go too. If you want to make streaky bacon, use pork belly instead of loin. Now you need to calculate how much curing salt you need. This may vary from manufacturer to manufacturer, so check their instructions, but the stuff I have says 50g salts per kilo of meat. So for 1.5 kilos, I need 75g. All you need to do is rub the salts in all over the pork. Work it into any nooks and crannies, and don't forget the ends. To calculate the curing time, measure the thickness of the meat at its thickest part. You need to allow 1 day for every 13mm (half an inch) of thickness, plus 2 days extra. For my piece, that works out at 7 days. Place the meat into a freezer bag and pop it into the bottom of your fridge. Turn it once day day. When the curing time is up, remove the bacon from the bag and rinse it thoroughly in cold water. Then let it soak in cold water for a couple of hours. Finally, dry it on kitchen paper, and then hang it up to dry completely for a couple of hours, preferably with a fan blowing over it. During this time, a thin skin ('pellicle') should form. Your bacon is now pretty much ready. If you have a bacon slicer, you can slice it into rashers. If not, wrap it in plastic film and put it in the freezer until it is almost frozen. Then take it out and slice it as thinly as you can with a sharp knife. You probably won't be able to manage anything less than about 3mm, but I like a good thick rasher. And that's it! Delicious bacon you can be proud of. The video above is from the Keef Cooks YouTube channel. 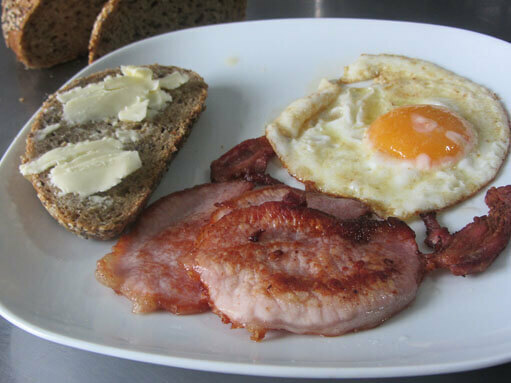 Click here to see the video recipe of Home Cured Back Bacon on YouTube. Prep time: 30 mins. Curing time: About 7 days. Total time: 7 days and 30 minutes.